An Urban Cultivator can bring the nutrition of fresh food to your table in Edmonton, and you don't have to own even a teaspoonful of real estate. You know that freshly picked greens and herbs not only taste better than what you purchase in the store, but are healthier for you and your family. Until recently, your only choices may have been a plowed garden or windowsill pots. Now, however, you can enjoy fresh greens in your meals while creating a compact, attractive space that lights up your kitchen. If you plan to renovate your existing kitchen or are building a new home, designing a space for an Urban Cultivator is simple. One unit uses 24-inches – or about the space needed for a dishwasher. Your growing space will fit under the counter, and drawers of nutritious goodness can pull out for your snipping pleasure. Eight different plants can be grown at one time in an Urban Cultivator. 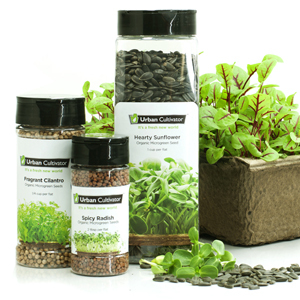 Make the space count with a mixture of herbs, microgreens and organic vegetables. Everything is more nutritious and tastier when it is so fresh, and your entire family benefits. 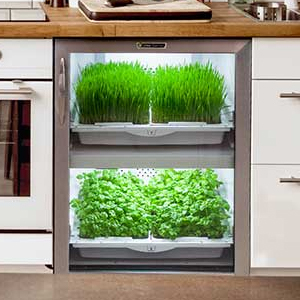 Your Urban Cultivator will make the process simple as the company has developed everything your green thumb needs. Special organic seeds of a wide variety of plants are available for cultivation. Grow lights replace sunshine, and irrigation conduits hooked to your incoming water supply automatically provide the correct amount of moisture for your plants. All the guesswork has been removed to take the worry out of growing your own food. You can create your own green space, winter or summer, in an Urban Cultivator in your Edmonton kitchen – no fuss, no mess.